Led Zeppelin auditioning a replacement singer? 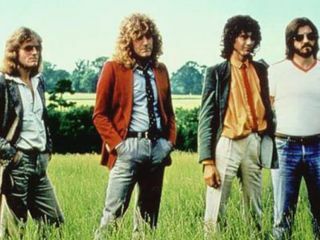 Led Zeppelin auditioning a replacement singer for Robert Plant could be filed under "Yeah, right" or "Now we've heard everything" - especially when the source is The Sun, Britain's biggest tabloid newspaper. But some of the most bizarre Led Zeppelin tales have turned out to be true, and according to the story, guitarist Jimmy Page, bassist John Paul Jones and drummer Jason Bonham have been rehearsing in West London's Ritz Studios trying out stand-in vocalists. It is also rumored that an "American singer" (Dave Grohl?) has been the most impressive of the lot so far. All of this comes at a time when Zeppelin tour fever is at an all-time high, compounded by Robert Plant's apparent reluctance to sign-on due to the mountains of "paperwork" that such an undertaking would entail. Plant is also enjoying what has been a long and successful collaboration and tour with bluegrass singer-musician Alison Krauss. According to an unnamed "source" close to the band,"Jimmy, Jason and John are determined a tour will go ahead next year. They've been rehearsing frequently in London and the band is really gelling. There's an American guy who has been standing in for Robert regularly and doing a great job." The source adds, "Obviously they want the original frontman to join them on the road but he still won't commit. They will be finalising plans for shows over the next couple of months and will tell Robert that if he doesn't want to be involved they will go ahead without him." Could it even be called "Led Zeppelin"? A Led Zeppelin tour without original drummer John Bonham is one thing - Jason Bonham has the bloodline going for him and was accepted enthusiastically at the band's one-off reunion show last year at London's O2 Arena. But a Zep tour without Robert Plant is quite another. And legally, could it even be called "Led Zeppelin"? Page could always talk to Doors keyboardist Ray Manzarek, who along with guitarist Robby Kreiger, is performing a Doors show withThe Cult's Ian Astbury standing in for the late Jim Morrison. But Manzarek and Krieger, after being sued by drummer John Densmore and the esate of Jim Morrison, had to bag the name Doors Of The 21st Century. They now tour as Riders Of The Storm. MusicRadar has to say, the thought of Page, Jones and Bonham hitting the road as Houses Of The Holy is more than we can stomach. Robert, your band needs you.